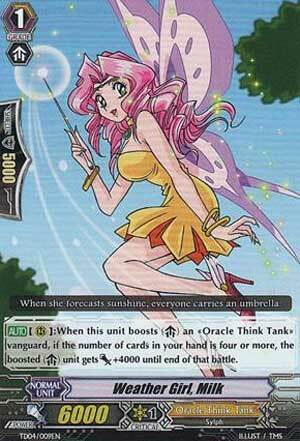 [AUTO](RC):When this unit boosts an «Oracle Think Tank» vanguard, if the number of cards in your hand is four or greater, the boosted unit gets [Power]+4000 until end of that battle. ...so apparently, this was #18 on that one site of Best Cards of 2011. Personally, it's definitely a great card especially seeing how Oracle Think Tank normally get a pretty stellar hand size very early on and can maintain it just as easily. For Milk, you just need to have 4 or more cards, and if you do, then she's a 10,000 point booster for your Vanguard, and last I checked, that's probably the best that most clans will get these days as far as a point boost goes! If I had any drawbacks about this card, it's that it can only be 10,000 by boosting the Vanguard and it's 6,000 any other time which is just alright. Overall, most players play 2 of these in a deck for a very good reason!